I’ve fallen behind in my USCL updates, although this time it was maybe some sort of “strategery.” In Week 7 (now almost 3 weeks ago), the SF Mechanics squared off against the Chicago Blaze. At the time, the Blaze were still perfect with a 6-0 record – now they’re still running away with the division, but Miami handed them a loss in Week 8. Chicago can feature a 3 GM lineup with a current 2200-USCF player on board 4 which makes them a pretty tough matchup for any team. Against us, though, they had GMs Shulman and Amanov on boards 1 and 2, followed by IM Angelo Young, and NM Sam Schmakel. San Francisco countered with me on board 1, followed by GM Jesse Kraai, IM Daniel Naroditsky, and Uyanga Byambaa. After heading over from work, the games got underway at 5:30 PM. The full game can be replayed on the USCL website here. Last time I played Yury, it was the 1st round of the US Championship and I surprised him with the Queen’s Gambit Declined, via a 1.d4 Nf6 2.c4 e6 3.Nf3 d5 move order. 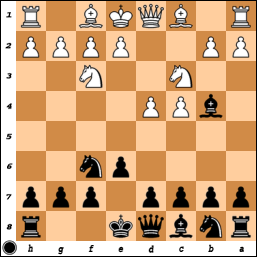 This time Yury played 3.Nc3 instead, so I followed through with my “threat” to play the Nimzo Indian with 3…Bb4. Then a bombshell dropped – 4.Nf3. This is obviously pretty common, but when I saw this move, I pretty much said “oh s%!$” to myself. When preparing for the game, I did notice that he had played a bunch of games with 3.Nc3 in the past. 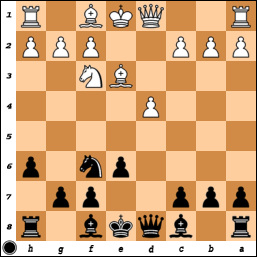 However, all those games continued with 3…Bb4 4.e3, a line that I have played with the white pieces. With over 20 games of experience in that line and having tried virtually every move order possible for White, I felt like I’d be able to navigate the opening without much specific preparation. Moreover, I only saw one game in the past decade where Yury had gone that route.